In 1878, Northern Thrace was incorporated into the semi-autonomous Ottoman province of Eastern Rumelia, which united with Bulgaria in 1885. 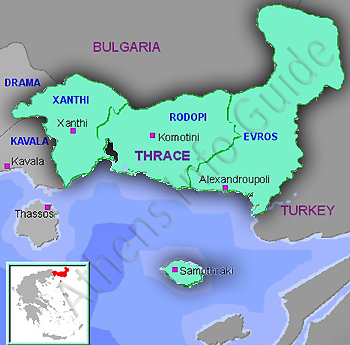 The rest of Thrace was divided between Bulgaria, Greece and Turkey at the beginning of the 20th century, following the Balkan Wars, World War I and the Greco-Turkish War. Today Thracian is a strong regional identity in Greece, Bulgaria and Turkey. Cities in Greek Thrache (Thrachia): Alexandroupoli, Abdera, Didymo- teicho, Komotini, Lavara, Pythio, Orestiada, Samothrache, Sapes and Xanthi.